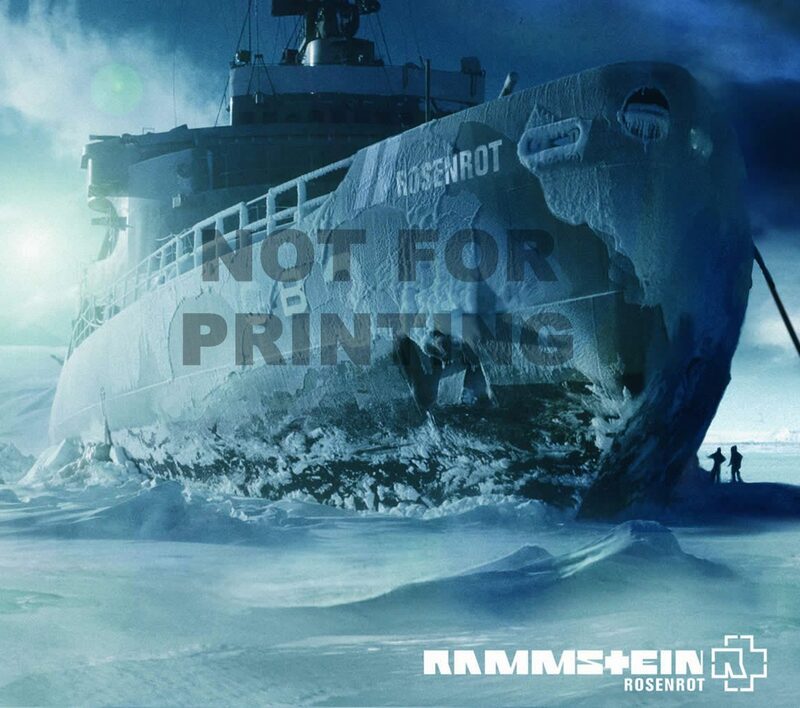 Rosenrot (German for “Rose-red”, listen) is the German NDH-metal band Rammstein’s fifth musical album. It was released on October 28, 2005 in Germany, December 6, 2005 in Canada, and March 28, 2006 in the U.S. A limited edition with a bonus DVD is also available. The album includes six unreleased songs from Reise Reise that had been omitted for artistic reasons, and five completely new ones. It was originally going to be titled Reise, Reise Volume Two, but on August 18, 2005 the album was announced as Rosenrot. While Rammstein did not actively promote this album, the band built anticipation through a variety of means. The first single from the album, Benzin, premiered at the Berliner Wuhlheide and has been subsequently released. Rammstein’s official website features one-minute samples from six of the album’s songs, and had featured a prominent release-date countdown. 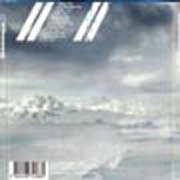 A brief section of the chorus from “Rosenrot” plays in the background of an e-card containing photographs of the band and basic album information. 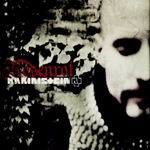 “Benzin” (The German word for Petrol, or Gasoline) was the first song to be introduced from Rosenrot. 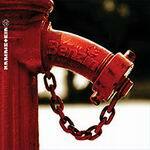 Rammstein first played “Benzin” live at Berlin’s Wuhlheide Park in June 2005. Theatrical flames shot twenty meters into the air during the live performance. Later, the song was also played at several other concerts, one of them at NÃ®mes, which is included on the band’s new live DVD Völkerball. It is the only song to have been played live to date. The Music video depicts the majority of the band as bored firefighters who receive a call and drive an oversized firetruck, destroying everything in their path to reach one survivor – Christian Lorenz – who they totally fail to save. The lyrics are an amalgam adaptation of Johann Wolfgang von Goethe’s poem “Heidenröslein”, and the story “Schneeweißchen und Rosenrot” from the Brothers Grimm (Goethe’s poem “Der Erlkönig” similarly inspired the “Reise, Reise” track, “Dalai Lama“). The song talks about a girl who sees a rose on the top of a mountain, she asks her boyfriend (“loved one” in the song) to go up after it and to bring it to her. He climbs the mountain and sees the landscape below, but he is not interested in it due to his love to the girl. Eventually a rock breaks under his boot and he falls, and dies. In the video, the band, dressed as clergy members, arrive at a Romanian village (actually called Zarnesti) in the Carpathian Mountains. Till Lindemann’s character becomes romantically involved with a younger girl there, and eventually murders her parents at her request. She then betrays him, and the villagers burn him at the stake. The girl is CÄƒtÄƒlina Lavric, born in BotoÅŸani, Romania, age 14, a model for Etoiles Agency. The casting director for the video was Sorin Tarau, Standard Casting. “Spring” (Jump) is about a man who climbs high onto a bridge just to see the view. A crowd gathers, thinking that he wants to commit suicide and encourages the man to jump. The man tries to climb down but the crowd doesn’t let him. In the end, with people screaming at him, he is kicked off the bridge by a member of the crowd (Till’s “character” in the song), saving him, as they see it, from his shame (of being mentally unable to jump). The song has a very melodic, gentle and melancholy keyboard-based chorus, accompanied by Till’s trademark voice. When asked about up-coming music videos in a recent interview, Richard mentioned that the next video will be for Stirb nicht vor mir, saying: “We will do one more for the duet with Sharleen.”. “He met a girl that was blind, shared pain and like-minded. Saw a star go from the sky and wished that she could see. In the background a cute, child-like keyboard can be heard. It ends with some odd discordant notes. In the chorus of “Feuer und Wasser” (Fire and water) , Till Lindemann sings “Feuer und Wasser kommt nicht zusammen” (Fire and water doesn’t come together). While this would be grammatically incorrect, the use of the singular third person verb kommt rather than the plural kommen indicates the intent for fire and water to be viewed as a single entity. Thus, a literal translation would be “Fire and water doesn’t come together”. In fact, when Till Lindemann sings this sentence, he doesn’t say “da kommt nicht…”. (fire and water, (it) doesn’t come together). This song tells of a man who is madly in love with a woman that has no interest in him (Sie schwimmt vorbei bemerkt mich nicht, Ich bin ihr Schatten sie steht im Licht|She swims past and doesn’t notice me, I am her shadow, she stands in her light). “Ein Lied” (A song) is one of Rammstein’s few slow songs, such as Nebel. It features acoustic guitars, bass, ethereal synthesizer sounds somewhere in between strings and choir, and a theremin-like keyboard lead doubled by another synthesized string part. Till’s lyrics are partly spoken and partly sung in low breathy tones. He sings “Spielen wir für euch” [We play for you]; it is a song for the fans of the band. The song is by far Rammstein’s softest song; it has no percussion, and is sort of quiet and dreamy. The end of the song is met without much spectacle, as the keyboards die away. Performances taken from the DVD Völkerball. Bassist Ollie Riedel briefly discussed the songs on Rosenrot with Kerrang!, a music magazine published in the United Kingdom. Wo bist du? : “We wanted to make Reise, Reise one of the hardest albums we’ve done, so a few gentler songs were left over, and this is one of them. 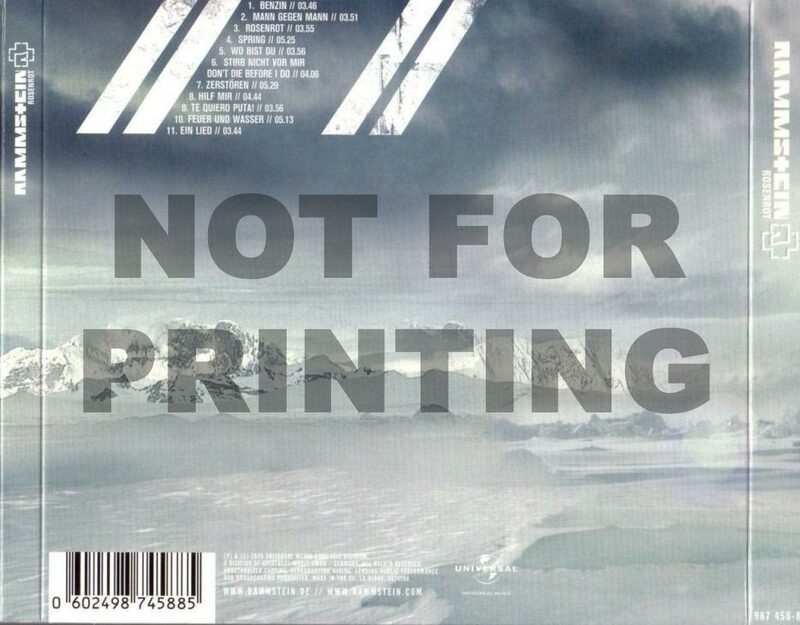 But we don’t want you to think it’s a leftover, because it fits on here perfectly”. Following a press meeting, the editor of the German metal magazine Metal Hammer reviewed nine of the tracks on the Rosenrot album. Spring: “The most emotional story on “Rosenrot”, about a person who wants to get closer to Heaven, but ends in Hell instead. Menacing guitars rear up, the song stamps along until a piano lightens up the atmosphere. After that the song takes a short run before jumping: the guitars roar and breathe heavily. Then Rammstein reduce the speed and the instruments die away like waves. In the end, you can hear a droning/humming crowd. Touching. Te quiero puta! 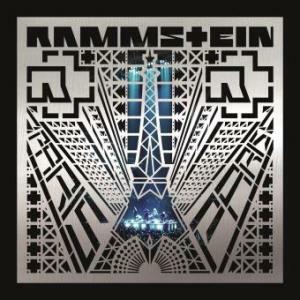 : “Rammstein start with a cool Hey amigos!, and the dusty ride through the desert begins. Trumpets and an industrial rhythm: a weird combination. Till, acting as a Mexican bard, rejoices Vamos, vamos mi amor and his female counterpart answers. During the song, Till’s voice gets more and more massive, the trumpet players give everything, you can hear bottle jingles. In the end, Rammstein carry the fun to extremes with a powerful Hoi, hoi, hoi before the song vanishes in the sundown, accompanied with the sound of pattering hooves”. Retrieved from en.wikipedia.org/wiki/Rosenrot Read the copyright at the bottom. I am glad Rammstein sings in german.I don’t know why.I wouldnt want them to start singing there songs in Enlish.